The PPP and Quinnipiac polls make it three surveys in a row where Obama has held a statistically significant lead in Colorado. In fact, he appears to have built up a pretty decent-sized lead, with Colorado is now polling between 2 and 3 points ahead of his national numbers. Suppose that we rank the states from best to worst for Obama, and count up the number of votes we collect along the way. For each state, I'm going to list something called +/-, which is the state's performance relative to the national popular vote projection. That is, since our model projects Obama to win the popular vote by 2.2 points, we'll subtract 2.2 points from each state to get our +/- rating. In other words, this is what we'd expect each state to look like if the national popular vote were tied. 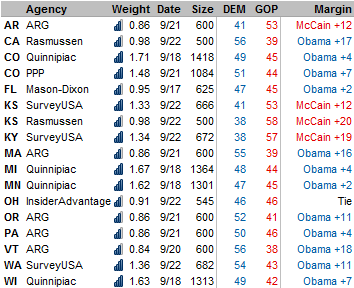 What you see here is that Obama gets up to a 269-269 electoral tie with relative ease. The state that gets him there is Colorado, but Colorado is still polling more than two points better than his national numbers. In theory, that means that Obama could lose the national popular vote by 2.2 points and still be even-money to manage an electoral tie. A tie, of course, is not his optimum result. Although Obama would probably prevail when the vote went to the House, it wouldn't make governance very easy. The 270th electoral vote, however, is more difficult. The best place for it right now looks to be Virginia, which is polling right at the national average. Then you get New Hampshire, which is half a point behind the national numbers, before running into the big behemoths of Florida and Ohio, as well as Nevada. What's interesting about this scenario is that if all you need is one more electoral vote to break the tie, it doesn't matter where you get it. New Hampshire and its four electoral votes would do just as well as Florida and its 27. Hell, one of the Nebraska Congressional Districts (which don't presently appear to be in play, but none of the recent polling has broken out the numbers) would also do the trick. So, depending on just how solid Obama feels about Colorado, one can argue that his campaign should spend more time focusing on states like New Hampshire and Nevada, which are much cheaper to compete in than Ohio or Florida. The Obama campaign also needs to think about whether it considers a 269-269 tie to be a desirable outcome, since this strategy only makes sense if you're concerned about 270th electoral vote rather than the 269th. Of course, it's probably too soon to get into this level of detail. But if the gap continues to widen between Colorado and Obama's next-best tier of states, it becomes worth considering. Obama also got good numbers today in Wisconsin, Florida and the Pacific Northwest. Oregon and Washington just aren't likely to play a starring role this year, or so it seems. Florida, meanwhile, is really starting to nip at Ohio's heels, and the Obama campaign has noticed, ramping up their ad spending in the state. McCain does get one good result, in Minnesota, where Quinnipiac shows it as just a 2-point race. The model is now starting to take Minnesota seriously as a swing state. It has moved ahead of Wisconsin on McCain's list of targets (remember that Minnesota doesn't share a border with Illinois whereas Wisconsin does). And it may even be on the verge of overtaking Michigan. So what is it about Minnesota? Well, McCain is spending a ton of ad money there, and Obama isn't. It is sort of McCain's version of Indiana, where the opposite is true. (Although, there is one important distinction: Obama still has a fairly robust ground game in Minnesota, whereas McCain has none in Indiana). In both Minnesota and Indiana, the candidates are playing a sort of electoral Showcase Showdown: optimal strategy dictates that you want the opponent to come as close as possible without going over, wasting resources on a state where they just can't quite overtake you. As these states have tightened, both campaigns will now have to decide whether they have gotten to the point where they are actually at risk, or whether they want to lay low and induce their opponents to chase good money after bad.